Start smiling again with beautiful, natural-looking dentures from California Dental Care & Orthodontics. We know missing some of your teeth can deal a serious blow to your self-esteem. That’s why we are pleased to offer patients the option to restore their smiles with several types of dentures in Rancho Cucamonga. What Is the Right Type of Denture for You? We want patients to have choices when it comes to selecting dentures, and our experienced dentist will spend as much time as you need to educate you about the different options you have at our practice. Full Dentures – If you are missing most of your teeth, we may recommend that you choose a full denture, which consists of a lower arch, an upper arch, or both. Partial Dentures – We recognize that most patients want to keep their original teeth as long as their remaining teeth continue to be healthy and fully functioning. A partial denture is an excellent option for patients who are missing teeth but also still have remaining healthy teeth. Implant-Supported Dentures – The dentures are permanently attached to “All-On-Four” dental implants to accurately mimic your natural teeth. 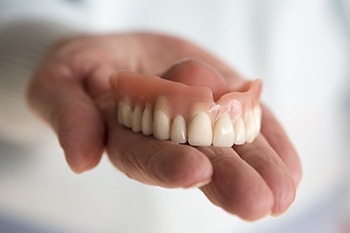 Implant-supported dentures give you a secure bite, allowing you to eat, drink, and speak with more ease and comfort than traditional dentures. Are You Ready to Make Your Appointment for Dentures in Rancho Cucamonga? Our 5-star cosmetic dentist looks forward to helping you with dentures or any of your dental care needs. In addition to dentures in Rancho Cucamonga, we also offer cosmetic options for teeth whitening, veneers, inlays, bonding and more. To make your appointment, give our office a call at 909.945.0024 or click here for our convenient online appointment request form. Take Advantage of One of Our Multiple Free Consultations – Free Bonus Gift for Saturday Appointments! If you are a new patient and wish to schedule a Saturday appointment for your complimentary orthodontic, dental implants, or sleep apnea consultation, you’ll receive a free whitening kit! As one of the premier dental and orthodontic practice in Rancho Cucamonga, our team at California Dental Care & Orthodontics also provides dentures and other cosmetic services to patients from Rancho Cucamonga, Alta Loma, Ontario, Upland, Claremont, Fontana & Rialto, CA.